When Model-Ts started rolling off the Ford’s Highland Park production lines in 1908, there were only around 200,000 cars on the roads in the USA. Few foresaw the spread of suburbia, out-of-town shopping, drive-thru restaurants, working at the car wash and road trips down Route 66. Nor did anyone foresee how economically significant the auto industry would become. By 1955 USA’s top 10 biggest companies included: General Motors, U.S. Steel, Chrysler, Standard Oil of New Jersey, Amoco, Goodyear and Firestone. Cars helped drive huge change in the mid-20th century, including entirely unexpected knock-on effects such as the fact that 25% of the USA’s agricultural land, which had been used for rearing horses, was then freed up for human food production. The consequences of new technologies are hard to predict. When Wall Street bankers were first sighted barking into mobiles the size of breeze blocks, the phones were written off as Yuppie toys. Now 7 in 10 of the world’s population owns a phone, although we spend more time browsing photos, ordering cabs, checking the news or swiping right, than talking on them. Four of the top 10 most highly valued companies in the world are Apple, Alphabet (formerly Google), Facebook and Amazon – all of which earn much of their income via phones in one way or another. Yet as mobile sales peak and innovation in that sector slows, cars are re-entering the frame as one of the next drivers of social and economic change in the coming decades. The big impacts will be felt cumulatively, in three successive waves: servitization, electrification and automation. As ever the question is less if thesedevelopments will happen, but when they will start to have widespread impact (see p12-13). The first Benz Patent-Motorwagen was built in 1885, but the first US highway didn’t arrive until 1925 by which point 50% of American adults owned a car. By contrast, it took mobile phones less than 15 years to reach the same level of adoption. These waves will influence, but not determine the future. The choices that society makes will. Just as the urban planner Robert Moses introduced urban express ways into New York, whereas Copenhagen elected to keep their existing roadgrid, so cities will have to make decisions about mobility. 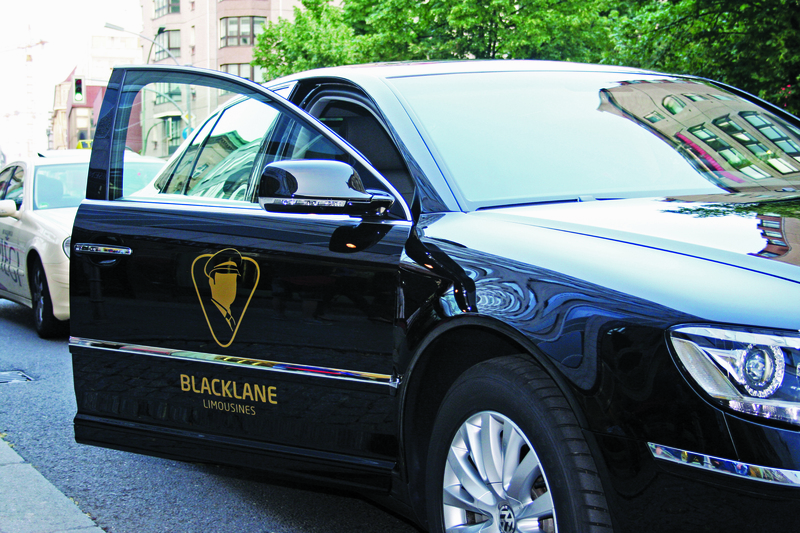 Blacklane is a rapidly growing professional chauffeur service - a 'business class' Uber. The impact of the first wave, is already being felt in urban centres around the world, epitomised by Uber’s explosive growth since 2014. Urbanites are increasingly opting to access ride-hailing services like Uber, or car-sharing from the likes of DriveNow and Car2Go, and for longer trips ride-sharing or car-pooling services such as BlaBlaCar in France. Private car usage and ownership in cities is set to fall, as mobility services grow in reach and drive down prices. City authorities are also playing their part, as they introduce inducements to ditching cars. This in turn will present the governing authorities of cities with new choices. Gradually drop-off and pick-up areas will replace parking spaces at popular destinations. Those that can afford these services gradually cease to think of cars as general purpose, and begin to select different vehicle types and services for different kinds of trips, from a shared mini-bus for the commute, to a slick sedan for date night. Jobs in car dealerships will most likely fall due to the decline in private sales, while those in car maintenance, washing and valeting will rise – as the cars on the road will be much more heavily used. This wave on its own is relatively low impact compared with what will follow, primarily because it is largely an incremental improvement on traditional taxi services and uses existing vehicles, smartphone platforms and consumer behaviours. The key choice is for cities to decide to what extent they should restrict global players and allow local competitors into the market, using local labour laws as a means control to this. 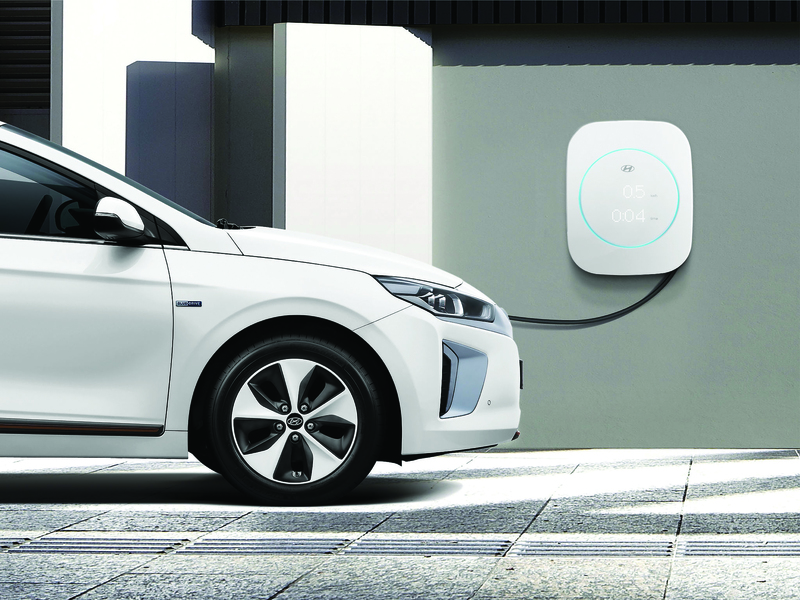 Hyundai IONIQ home charger displays charging information on its integrated screen. 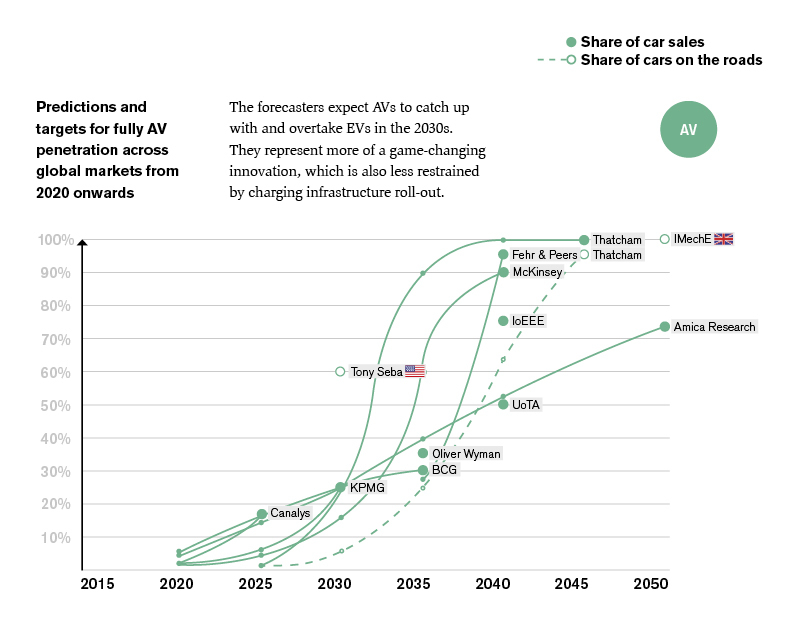 The next wave will see the shift to EVs. Take Tesla as an example. Despite its current high profile, Tesla’s sales currently account for less than one percent of global car sales – although 29% of cars sold in Norway in 2016 were either pure EVs or plug-in hybrids. Global sales growth actually slowed in 2016, but they are likely to pick-up as automobile companies bring more affordable models to the market, and more critically, cities and governments introduce more stringent emissions legislation. As each successive wave builds on the previous, the choices and tensions will get more substantial. With EVs, there are obstacles of course. For example network overloads occur when there is a high concentration of EVs being charged at the same time. In suburban areas, there are relatively few obstacles for private owners of EVs. Houses have a garage or driveway that is suitable for overnight charging and often at least one other vehicle. This is the scenario that Tesla enjoys currently. However, the low emissions benefits of EVs are most needed in cities, where many private owners street park and taxi drivers will need to regularly recharge. The existing inner city charging infrastructure is wholly inadequate for these users, with few credible roll-out plans in place. Besides finding locations for and installing a network of charging points, the electricity grid in most cities will also require a major upgrade to supply the capacity required. For these reasons and more, Plug-in hybrids are likely to be the preferred option for years to come. The urban charging challenge is likely to be tackled in many ways. It will require a great deal more than for existing fuel stations to turn their forecourts to charging bays. 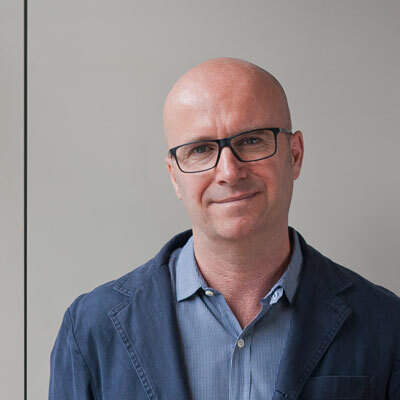 Juicing up a battery takes a lot longer than a fuel tank, so it’s likely that charging hubs will emerge that combine bays with cafes, co-working spaces and retail areas. 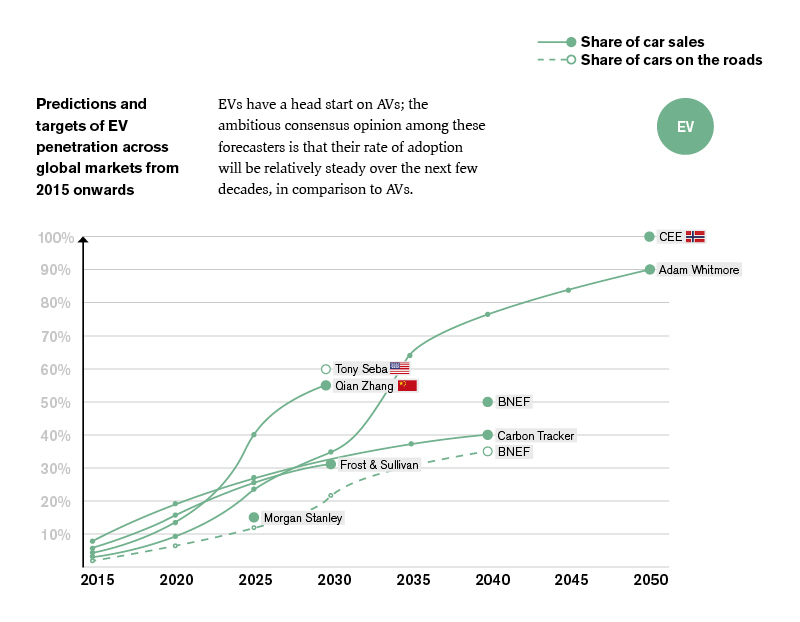 EVs’ impact will take longer as it relies on innovation, particularly around battery performance. A new urban charging infrastructure needs to be built as well as a system of legislative inducements. 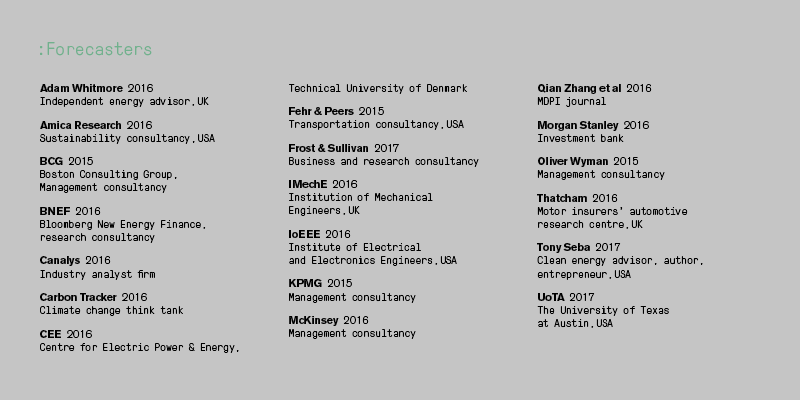 This will require considerable investment, political will and co-ordination between players; from carmakers to city authorities and energy companies. And some consideration of consequences. When EVs are adopted in significant numbers, national governments will be presented with a big taxation choice. After all 4% of UK tax revenue comes from fuel duty. As fuel consumption falls, will the tax burden be switched to electricity or road usage or a combination of both? 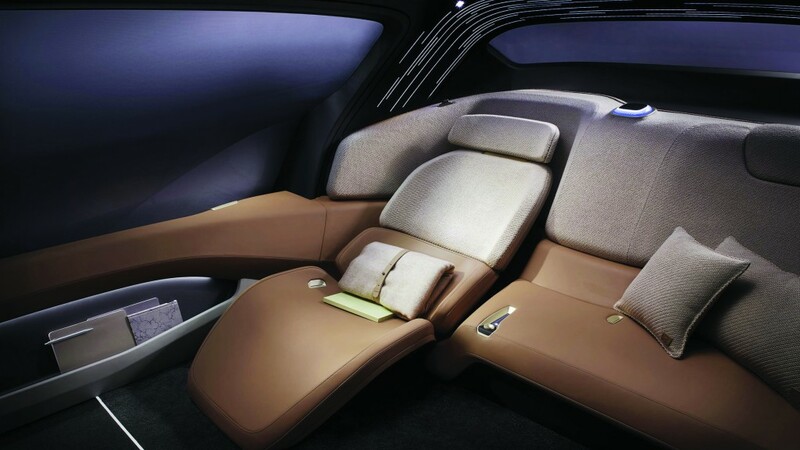 In the NIO EVE's interior two facing seats surround a fold-out table to provide a multifunctional space. The first two waves will rock the boat of urban mobility. The third will flip it. Much of the debate about AVs has until now focused on when the technology will be ready, how road regulations will adapt and to what extent road accidents will be eradicated. If we raise our horizons beyond these technical questions and assume they will be resolved over the next 5-10 years or so, we can ask ourselves: what kind of social, urban and economic changes do we want autonomous vehicles to drive? The most disruptive change is likely to be the plummeting cost of door-to-door transport. As most driverless cars in urban areas will be provided as a service by the likes of Uber, and without a driver to pay, price per mile is likely to drop to $0.50 from $1 to $1.50 per mile. This will challenge the viability of buses and trams on many routes, and is likely to blur the boundaries between shared and public transport. One potential model is that local transport authorities will form partnerships with ride-hailing services. In Florida one authority is currently subsidising Uber rides on routes it does not cover. This plunge in cost is likely to increase the demand for mobility. One recent study estimated that demand may rise by as much as 30 percent. There are two ways in which city authorities can respond to this. On one hand, they can embrace the potential expansion of their citizens’ mobility, and use smart routing and other means to maximise their road capacity. On the other, they can curtail car usage, through various tactics such as dynamic congestion charging. Whilst the latter of these tactics may seem the more likely in today’s climate, this situation may change. Certainly, it will be a matter for different governments and mayoralties to deal with in their own way. Throughout the 20th century workers were able to live further away from work as transport became faster, although two hours each way tends to be the maximum most will put up with. But what if people could begin and end their working day productively on their door-to-door commute? How much faster could longer distance commutes get, if AVs can use high-speed lanes, where they platoon in close formation? How will the perceptions of sitting in traffic change, if that time can be used for business or pleasure? Would this encourage some to live even further away from their workplaces than today? The implications for cities is significant as well. Most driverless vehicles will be more utililised than typical manual cars which typically spend 95% of their time parked up. As the need for parking space and potentially bus lanes tails off, city authorities will find new public space to play with. To what extent will increasing road capacity figure in city plans? How much space will be needed for charging and valeting cars? These are just some of the questions that will need to be addressed. Other more contentious decisions that policy makers will need to grapple with include policy decisions relating to manually driven cars. Will they for example be banned on public roads? How will safety issues be reconciled with those of personal freedom. Northern European nations are likely to emphasise the former while Americans surely are more likely to privilege personal liberty over pure safety arguments. Another dilemma will hinge around the amount of data collected by AVs. It is estimated that the camera, radars and other sensors of a typical car will gather 4,000 GB of data per day relating to road, traffic and weather conditions as well as the behaviour of the car’s passengers. While not all of this will be uploaded, who should have access to the data when it is, and more pointedly do they have the right to monetise it? Should certain types of data such as road conditions be made open source to aid safety and traffic flows? From a privacy perspective, there is also the much-flagged challenge of cyber security, high standards for which will be a prerequisite. Finally, what are the vehicle design choices ahead? Mobility providers will probably require a wider diversity of vehicle types: from narrow single-seaters to mini-buses. These will be designed for heavy usage and easy cleaning, rather than the identity signalling that drives the design of privately owned cars. As there won’t be a steering wheel and only a minimal instrument panel, the interface with passengers is likely to be simplified, although AVs may be required to signal their intentions to pedestrians in new ways. With no need for front seats to face forwards, designers will have more freedom with the internal configurations of cabins. 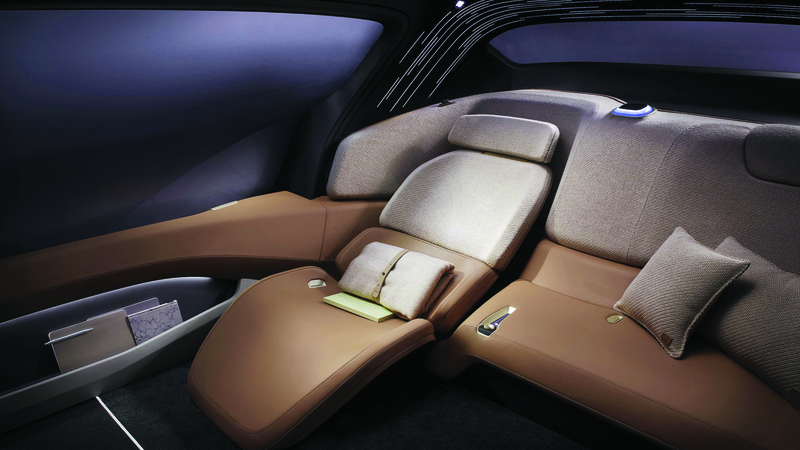 Eventually safety regulations will be relaxed, which will free up space as there will be less need for crumple zones and airbags. These are just some of the opportunities, questions, and choices that are coming into view on the road ahead. But as the futurist and author Carl Sagan once said: ‘It was easy to predict mass car ownership, but hard to predict Walmart’. Following all the disruptive shifts throughout history, the knock-on effects and unintended consequences that lie over the horizon are hard to foresee. As the impacts are likely to be as major as the adoption of cars in the mid-20th century, the more we widen the discussion now, the better placed we’ll be eventually.